Cut Rite’s lawn maintenance services are a great choice for keeping your landscaping looking it’s best, throughout the year. We focus on improving the health and beauty of your lawn, trees and plantings. Services range from irrigation, mowing, aeration and mulching to plantings and tree trimming. We can do it all! 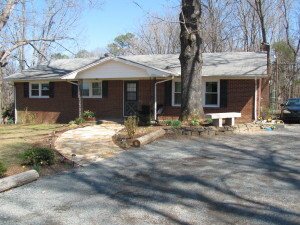 Cut Rite Lawn Care recently completed a landscape update to a rental property in the Chapel Hill & Carrboro area. We removed quite a few old shrubs and overgrown weeds. We transplanted the shrubs to the landlords other property to save her money. 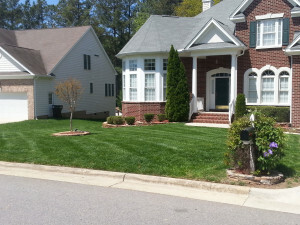 Cut Rite Lawn & Landscape LLC recently completed Phase 1 of this multi-phase landscaping project in Chapel Hill. 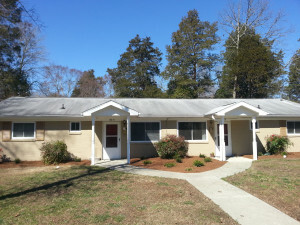 This rental property was in need of some sprucing up. We started by tearing out the old overgrowth and clearing other debris from the property. We established a perennial bed, built and installed a sand box for the tenants’ children, and installed a stone bench. We built a small stone wall and stone walkway lined with a mulched bed for future plantings. Welcome to the new and improved Cut Rite Lawn & Landscape LLC website. We are proud to offer our new site as a tool for current and future clients in the Chapel Hill, Durham and surrounding areas, to find useful information on our services and our company approach. We appreciate all visitors and ask that you please use the list of services below to find the correct Lawn and Landscape service for you. If you have questions or comments, please also feel free to use our contact form here.